I can’t help but think that Aaron is hoping that a claim of miraculous activity will somehow justify his action. Moses wasn’t buying it, as his actions show. We laugh, but how often to we make Aaron’s appeal? We despised him and accounted him nothing. Whether you apply this to Israel as God’s servant, or to the remnant of exiled Israel whom God would restore, or to Jesus as the suffering servant, it still refers to someone who is suffering, even though they are in the process of carrying out God’s plan. In Philippians (chapter 2 was the reading, but I refer back to chapter 1 as well), we find Paul in prison. He is suffering. There are those who proclaim the gospel in a way intended to give him pain. It’s possible these were people who thought their view and presentation of the gospel was superior to Paul’s, and were using his suffering as a basis for asserting that superiority. Surely God would free Paul if his teaching was so good! Yet in the key reading for today’s lesson, we have the note that Jesus did not consider equality with God something to be grasped or hung onto (Philippians 2:6), yet clearly it is not Paul’s intent to suggest Jesus, in giving up everything, was not following God’s plan. In discussing prophecy, many make frequent reference to Deuteronomy 18:21-22. If a prophet makes a prediction and that word does not come true, God has not spoken. This test of a prophet is both simple and deadly. Consider Jonah. He made a prediction, and that prediction did not come true. He was really annoyed, because he wanted Nineveh destroyed. I’m sure he was also annoyed, because now he was a false prophet. I call this the “dead test” for a prophet, because by the time you’ve completed your test and made a determination, you’re likely dead. Not an optimum strategy, I would say. Of course, if you’re not dead, find that prophet and a pile of rocks. In 1 Kings 22 we have a lovely story in which Jehoshaphat of Judah, by all accounts a good king, is visiting the king of Israel. While there, they get the idea to go to war. Jehoshaphat, good king that he was, wanted to consult the LORD. The king of Israel gets 400 prophets who tell the two kings to do what they want to do. So if you’re one of the two kings, how do you make a decision? If Micaiah is prophesying falsely, you can ignore him, but by the time you know that, you will also have lost the battle. Not so helpful! Deuteronomy has another test, however, and it’s an important one. If prophets or those who divine by dreams appear among you and promise you omens or portents, and the omens or the portents declared by them take place, and they say, “Let us follow other gods” (whom you have not known) “and let us serve them,” you must not heed the words of those prophets or those who divine by dreams; for the LORD your God is testing you, to know whether you indeed love the LORD your God with all your heart and soul. The LORD your God you shall follow, him alone you shall fear, his commandments you shall keep, his voice you shall obey, him you shall serve, and to him you shall hold fast. But those prophets or those who divine by dreams shall be put to death for having spoken treason against the LORD your God—who brought you out of the land of Egypt and redeemed you from the house of slavery—to turn you from the way in which the LORD your God commanded you to walk. So you shall purge the evil from your midst. In this case your test is one that can be done immediately. Is this person telling us to worship other gods? I wonder if that was not the reason Jehoshaphat doubted the word of the 400 prophets. Unfortunately, even though he was wise enough to ask for one more prophet, he was apparently unwilling to go with the advice of the prophet he requested. I’ve seen this used in connection with spiritual gifts. People look for a manifestation of miraculous gifts, sometimes a specific gift, or one off of a list Paul provides. But Paul is never intending to provide exhaustive lists of the spiritual gifts. That’s why his lists don’t match. He’s just giving us examples. In each case, he’s providing a different test, not one that appeals to miraculous (or at least obviously miraculous) activity. In 1 Corinthians 12, we are given a view of the real test in verses 4-7, as the example list is introduced. There are varieties of gifts, but one Spirit, one Lord, one God. It is by looking at the One in whose service the gifts are used that we can discern their nature. Scripture doesn’t provide us with a single, simple answer. It leaves us with the task of discernment. Are your troubles due to the devil trying to stop your carrying out of God’s work, or are they God closing doors? Is your wealth God’s blessing in response to your following God’s will, or is it the devil rewarding a servant? You find this out through prayer, thinking, discernment, study, and good counsel. The result may be miraculous! I was given the title “liberal charismatic” (not as a compliment) because I believe that all the gifts of the Holy Spirit are potentially in operation today and that God speaks to people now as much as he has at any time in history. On occasion, this makes for trouble, as people expect me to accept a variety of professed prophets as somehow authoritative due to the office they claim or that is claimed for them. In other word I believe in prophets and prophecy, but I do not consider any particular prophet authoritative as such. Going further, I very much doubt that I would have considered any ancient prophet authoritative solely on the basis that the individual made such a claim or that the claim was made about them. I doubt that the prophets themselves would expect such obedience to them apart from discernment. Moses is regarded as the greatest of the prophets in Hebrew scripture, and the record shows him making errors and being aware that he had done so. As a Christian believer in the incarnation, I would have to make a partial exception for Jesus, bearing the divine imprint (Hebrews 1:1-4), yet even here, I would suggest that one with discernment would note the message and the life and then be convinced. It is important here to distinguish inspiration from authority. Isaiah, for example, was an inspired person. This is my belief and the conclusion of the Jewish and Christian traditions. Further, both of those traditions have declared the book that bears his name authoritative. If we had lived in Isaiah’s time, however, while many of us would consider him inspired, we would find that his authority was much less accepted. I’m guessing, in fact, that Isaiah may have said many uninspired things in the course of his life, and many things that should not have been considered authoritative. He may well have said many things that were of divine origins that never made it into his book. If we found a fragment of a scroll the purported to contain sayings of Isaiah, and if these seemed, by the best scholarship available, to date back to Isaiah and to share literary characteristics with things we consider to come from Isaiah, would this fragment automatically have authority in the church? Absolutely not. We have canonized a book, not the theoretical potential output of a person, however inspired it may be. The homilies of St. John Chrysostom are quite inspiring, and perhaps inspired, yet they do not have the authority of scripture. In my own book When People Speak for God, I make the statement: “The last person, and the decisive person, to hear from God is you” (p. 4). I mean that very seriously, whether we’re dealing with the interpretation of scripture or hearing a word from one who claims to be a prophet, you need to hear, discern, distinguish, and act. I believe that anyone can hear from God. I consider this very scriptural, perhaps as scriptural as anything can be. It is demonstrated repeatedly in the text. We make the people who heard, such as Abraham, Samson’s mother, or Mary, very holy and so separate them. But when they heard from God, they were ordinary people carrying on rather ordinary lives. Anyone may be inspired. Authority results from discernment. Let me refer you to a couple of tests for prophets in Deuteronomy. The one we hear most is from Deuteronomy 18:22, which is that if their word is not fulfilled, they are false. (Jonah would have fallen on this test, but that is for further discussion. See Jonah: When God Changes.) But there is another passage, Deuteronomy 13:1-3, which provides another test. There it says that if someone makes this claim, and even provides a sign which comes through, if they then tell you to worship other gods, they must not be obeyed. As a final point on theory, there are those who consider that if a modern word contradicts the Bible it must be rejected, while if it is in accord with the Bible it is redundant. I would suggest that this presents a false (and possibly dangerous) dichotomy. Throughout the stories in scripture, God worked with and guided people, without ever giving an indication that this would change. In fact, I think the best reading suggests that God speaks a great deal and the limitation is more in the fact that we decide not to listen. When a spiritual movement is young and lively, people listen and generate ideas. Then comes structure. Structure is designed to limit and control this spirit. So the authorities tend to want to shut it down at the source. God is done speaking and he ended with the last book we want to see as authoritative. There is room for freedom, and there is some need for structure, but death follows allowing either of those needs to become absolute. Let there be authority, but let authority by challenged. I wrote all of that to form the basis for the following. I listen to and apply discernment to any claim, whether the person claims to be a prophet or not. I have generally found in my experience that those who make no claim to speak for God, but just speak what they have learned in their own communion with God speak with much more authority and wisdom than those who make the claim. I think there is a great deal of indiscipline, lack of wisdom, and general confusion in much of the current prophetic movement in Christianity. I will only make specific charges if a person is part of a community of which I am a member, but for myself I work to discern what God is saying. Part of that process is listening myself. The one way not to be manipulated is to be a student, a learner, a thinker, and to let the Spirit of Truth work. When that is said, don’t be arrogant. I could be wrong. You could be wrong. Being wrong isn’t the end of the world as long as you keep your mind, your hearing, and your discernment active. Tonight I’ll be continuing my study on Eschatology, using my Google+ page and YouTube channel. I’ll embed a YouTube viewer below. In preparation for this study I think it would be useful to read my post from earlier this morning titled Link and Notes on Textual Criticism. That may sound irrelevant, but in it I try to say something about why I study details even though I don’t think we can attain certainty that we have the details right. You may find that particularly unsatisfactory. If so, you will perhaps want to listen to the way someone else interprets prophecy and eschatological language. But I think you are likely to be disappointed. The field of prophecy, whether we’re talking about ancient Israel or modern prophets in the church, is filled with cute explanations for why various interpretations of predictions haven’t worked out. I think there’s a reason for this. Two options for that reason: 1) God didn’t want us to know or 2) We’re too stupid to figure out what God was saying. We’ve simply been wrong too many times. I could say that the literature itself has failed either because we couldn’t get what God had in mind into print or because God has failed. Always assuming, of course, that I’m not willing to go with the traditional approach which is to forget about each failed prophetic interpretation and go on making more and more unsubstantiated predictions. Instead, I’ve looked back at these texts and I don’t think we’re supposed to get that sort of detail out of them. What we’re supposed to be doing is looking at how God has worked with people, the manner in which God is with us in the interim. I think we can learn a great deal. So reading Revelation is not just a matter of looking for the literal meanings of various symbols. It is, instead a process of understanding how this text spoke to people in trouble and how it can speak to others who are similarly in trouble. I will be developing that point of view in this series. The critical think to note from last week’s presentation is learning to make a break from the puzzle pieces approach. Much of the writing and preaching on Daniel and Revelation, or on eschatology in general is based on this approach. If I can find the right place in the text in Daniel 7, connect it with the right place in Daniel 8 and then 9, connect all of those to Isaiah 65 & 66 at just the right points, pull in a verse from 1 Thessalonians, then tie all of that to selected anchor points in Daniel 12 & 13, I ‘ll know what’s coming next. I can make a chart. I can be safe. I would suggest that such charts are about as safe as the Tower of Babel. They come from our desire to eliminate uncertainty from our lives. We want to make our lives safe, to know what we will face, and most especially to be able to point to specific things we will avoid, while others suffer. In my view the pre-tribulation rapture partakes of wish fulfilment. We’ve read about times of trouble, and we want to find a way to say that we won’t be here for the greatest time of trouble. So we have found out when it will occur and we have found out that we can avoid it. Well, we think we can. You know what I think? If the pre-tribulation rapture is true, as a follower of Jesus I should want to be here after the rapture to help take the gospel to those left behind. Yes, I know, there are various explanations of why this wouldn’t be the case. I just don’t believe them. I will certainly be looking in this series at the wide variety of interpretations. How do we paste scriptures together to make doctrines such as the rapture? But I will be more interested in looking at the question of how we will live in the “God with us” period that stands between God’s creation in the beginning and God’s renewal at the end. One might try to discard apocalyptic because of what it looks forward to. If the period of trouble will (or may) end without the end of the world, so clearly expected by the writer of apocalyptic, of what good can the material be? Well, in each case the time of trouble did end, and there was something in that message that helped through the time. We’re going to look for that. Read Daniel 2 and 7. Now consider this: Is the key message in Daniel 3:18 or Daniel 7:13? (Leaving open the possibility that the answer is neither!) Which one do we quote or consult more? Tonight I’ll be talking about the purpose of prophecy. I don’t believe biblical prophecy is intended for the same purpose as consulting psychics. (Note: I’m not maintaining that psychics can provide accurate information about the future. In fact, I believe they truly cannot. But people consult them in that hope.) Biblical prophecy is intended to help us live in God’s world with the knowledge that whatever happens God is with us. I’ve had a rather intense week and haven’t done any blogging, so as I use the extra hour I got as we switched to standard time, I’m going to talk about Sunday School. Last week we discussed considerations of hearing. I’m going to include an extract below, with the subheading “Testing the Claim” from that chapter in my book When People Speak for God. But first, I’m going to include some additional comments. One of the things that I hear from non-charismatic evangelicals about charismatics is that we tend to get blown about by the “winds” of the various “words from the Lord” that we receive, either directly or through other people. There is a certain validity to this criticism. It’s very easy to claim that God told you something, especially when God told you that someone else should do what you want them to do. It’s amazing how many sides God is on! So it’s important to remind charismatics (and I count myself as one) that we need to test everything. Not everything—in fact, I would suggest very little—of what people claim is coming from God actually does. Evangelical Christians, however, have a similar problem with various wild interpretations of scripture. People are people, no matter how they claim to get their authority. So someone can claim to have found a new interpretation of scripture and make every bit as large of changes in the church as someone who claims to have heard from the Lord. This is what I emphasize in my book and in my class: Every claim of divine authority needs to be corporately and individually tested. It doesn’t matter if it’s an announcement that one has heard directly from God or a claim that one has found the one true meaning of a passage of scripture. Test it. In my book I say that the last person who must hear from God is you. None of these sources relieve you personally or your congregation corporately from the search for truth. You might be amazed at how frequently this occurs, and how easy it is to rationalize immoral behavior when someone is forcefully claiming that God has ordered it. Some people have claimed that God sanctioned adultery for them on some basis. I know of cases in which someone decided that God had ordered them to spend their rent money on a mission trip, and not pay their rent. If done without the permission of their landlord, that is at least unethical, and should cause one to consider carefully whether God is speaking. Don’t be led into immoral or unethical actions by a voice. ✔ “God’s words” come to a person in the course of debate. God’s command should generally be complete and straightforward, and shouldn’t require amendment. If “God” keeps coming up with new arguments over the course of the debate, just as an ordinary person would, think again. ✔ “God’s words” are presented in a divisive way, or introduce an element of divisiveness. or cruelty should be rejected. ✔ The person who presents God’s word reacts angrily to having that word tested by others. When someone is sure that God has spoken and others reject that word, it is appropriate for them to be grieved at that event, but they should welcome discernment and sincere testing, and they should be prepared to live with differences of opinion. ✔ “God’s words” deny established scriptural standards. Continuing revelation should not reverse what God has already said. The Bible has been tested and accepted by the church, so if you reverse major principles of scriptures, you are likely off track. This doesn’t mean that interpretations cannot be corrected, but soundly interpreted scripture should be upheld. I would note that regarding my comment on “denying established scriptural standards” I do not mean that the church cannot change. What I mean is that one person’s word from the Lord can’t turn everything on its head. Acts 15 provides a sort of model, I think, for this kind of change. Changing through corporate discernment may be a much longer process, but until it seems “good to the Holy Spirit and to us” (Acts 15:28 NRSV) conversation needs to proceed. We had an interesting discussion today in Sunday School. We were discussing the 3rd chapter of my book When People Speak for God, titled Messengers – God and Prophet. The questions at hand were just what is prophecy, who are God’s messengers (with a side-order of how can you tell) and how does getting a message from God work. I started by repeating an important point, I believe, that prophecy in a biblical sense is not the same as prediction. I do not deny prediction as a part of prophecy, but thinking of prophecy as primarily about prediction will provide a distorted view of prophecy. Denying all prediction will distort one’s view as well. Further, discernment is always a requirement. A key passage in considering discernment is 1 Kings 22. What lessons one might draw from that story might be quite interesting. But that discernment was needed is quite clear. This led us to the question of naming prophets. Who in the church today might be called a prophet? In the church I think we should be much less about who is in the office of prophet than was the case in Old Testament times, and much more about all God’s people being prophets, perhaps a fulfillment of Moses’ wish: “Would God that all the Lord’s people were prophets and that the Lord would put his spirit upon them” (Numbers 11:29). I think that this goes well with the idea of the priesthhood of all believers. It is not about finding people to occupy an office of prophet, but rather to recognize this gift when it is received and exercised. Many teachers and preachers speak with great authority and then say, “This is not me speaking. I’m only telling you what the Bible says.” But that assertion is always dangerous. When we apply the Bible to any particular situation we are interpreting. This is another case when one’s words can seem very pious, but actually border on sacrilege. What could be more pious than simply speaking God’s words and never adding anything of your own to them? But there is the problem. You and I are not capable of speaking “just what the Bible says.” There is always something of our own thinking and interpretation in what we have to say. forcefully someone says that what they say is simply God’s truth, whether they claim that they got it by hearing directly or by reading and interpreting sacred documents, discernment is always up to the individual hearer. A word of prophecy must be tested. An interpretation of scripture must be tested. Everything must be tested using the intelligence God gives you and the wisdom he promises (James 1:5). I already mentioned that I’m in the final stages of publishing a new book Eschatology: A Participatory Study Guide by Edward W. H. Vick. One of the things that Dr. Vick emphasizes is the abuse of the word “soon” in Christian teaching and preaching. There is a problem with definitions if you repeatedly claim that something is soon and then it doesn’t happen. On the one hand, if you define “soon” so that it has meaning, you have the problem of the prediction failing. On the other, if you keep “soon” vague enough to protect yourself from the failure charge, you generally make it meaningless, “nonsense” in the technical sense, as in lacking any meaningful sense. Dr. Vick even wrote a book on precisely that topic, The Adventists’ Dilemma. I must confess that I suggested reducing the time spent discussing the way the word “soon” has been used in the church. It’s interesting, but just how central is it to most Christians’ thinking? Well, I don’t know about most Christians, but abuse of the word “soon” or any of its related topics, such as “knowing the times” and so forth, is rampant. We’ve just gotten over the prediction of the second coming in 2011, and now we have another one (HT: Dispatches). Dr. F. Kenton Beshore, of World Bible Society, doesn’t claim a specific date, but provides a range of years over which the rapture and then the second coming should be expected. (I use the title “Dr.” out of courtesy, though the bio on the World Bible Society website does not specify where any of them were earned, usually a bad sign. In addition, a couple of the degrees are normally honorary.) His claim is that the rapture should occur between now and 2021 and then the second coming seven years after that. Those who are acquainted with popular literature on Revelation will doubtless note that Beshore is pre-trib based on these numbers. The reasoning behind this position, such as it is, is similar to Hal Lindsey’s belief that Jesus will return before the end of the generation that saw Israel reestablished as a nation in the promised land. It would be hard for me to comment in detail, except to note that the entire rapture, seven-year tribulation, and second coming scheme is produced through a hodge-podge of proof-texting. It’s not even as convincing as your average proof-text usage. The relationship between the various passages involved is more than doubtful. I believe it is popular, and seems plausible to many, for the same reason that action movies are popular. They’re exciting and satisfying, with plenty of action and suspense followed by a comforting resolution. The major argument in favor of a pre-tribulation rapture is similar. It’s comforting to think that before all the bad things happen, God’s people (in which group readers confidently place themselves) are removed from the scene. Reality, however, even the reality of life with God, is not as satisfying to our selfish desires as an action movie. God’s people have been left to live through times of trouble many times. They are never alone, thank God, but they are often in difficulty. One can get great comfort from a prediction of the end. It gives one such a sense of control, and such a fine feeling of safety. Bad things will happen to others, but not to the believer. Uncertainty is for others. The believer knows. But over and over such “knowing” has proven to be false. There’s no more reason to believe this result than any of the preceding ones. The word “soon” (or various ways of saying something similar) is being abused again. It’s interesting to me how we (and I definitely include myself) often read scripture. One concept can easily override another. For example, I recall a conversation in which someone was claiming that no human being was ever righteous. I brought up Job, who is described as righteous in Job 1. “Oh, but that is only as he was seen through the righteousness of Christ,” I was told. Of course, Job 1 isn’t speaking of the righteousness of Christ, and in fact the entire book would be very silly with that change. Job is concerned that he has been punished, but that nothing he has done deserves these results. This post is a follow-up to Psalm 89: When Eternal Doesn’t Last, and you should read that post first. It’s funny that I begin this post with an illustration from Job, because Job provides a counterpoint to the theology I’m looking at. Jeremiah 18, which I cited in the previous post, talks about how if God is sending disaster, and the recipients of the disaster repent, God will repent of that disaster. One implication that might be drawn is that good deeds result in blessing, and bad deeds result in curses. One need look no further than Deuteronomy 28 to find this theology made explicit, and it is repeatedly hammered in through the various books of the Deuteronomic history. But what I’m more interested in here is the interactive nature of the texts, the way in which people’s actions are woven in with God’s will with the implication that you can change the future. Even if God has said things will go one way, that might be changed through human action. In theology we tend to reconcile the differences in some way. God might only appear to react to the actions of humans, but he actually knows precisely what is coming and he does precisely what he planned. It may be considered blasphemous to suggest otherwise. But open theism and process theology both suggest that God is more interactive than traditional theology holds, though to different degrees and in different ways. My interest here is in the way we read the biblical text, and the way that we understand prophecy and its fulfilment. I’ll get to the covenants shortly. Imagine a father who tells his children that he will take them all to the movies in the evening. Now think about the father’s mental processes. Did he suddenly realize that in the fixed future he would have taken his children to the movies, and thus he informed them of this information he had received (or divined, perhaps)? Or did he decide at this moment that he wanted to take his children to the movies, and that he would, in fact, do so this very evening? Given that this human father does not know the future, such as to see himself taking future action, we’ll have to assume the latter. He makes a decision in the present, and he announces it to his children by saying, “I’m going to take you to the movies.” At the point at which he makes that statement it’s true. Being an optimistic sort, this particular father doesn’t think of all the possible reasons he might not make it or might change his mind. He just says he’s going. Let’s imagine now that the children, having heard of their good fortune, decide that nothing else matters. They fail to do their chores. They ignore their mother. The fail to put away their toys. They say unfortunate things. In fact, they generally make life miserable for their parents. Now the father says, “Because you have been misbehaving, we are not going to the movies any more.” Does this make his earlier statement a lie? It was true (at least in intent) when he said it, but it does not actually take place. My suggestion is that prophecies are more like this father’s statement than they are like scenes which one might see in a crystal ball. (If crystal balls worked, which they don’t!) When God says “Nineveh will be destroyed in 40 days,” he doesn’t mean that he has observed the future and seen that this happens, but rather that he intends, in 40 days, to destroy Nineveh. That’s clearly the way the Ninevites understand it. It’s the way Jonah is afraid it’s going to work. I’m not certain how much difference there is between these two ways of thinking when it is God making the promises or predictions. It makes a great deal of difference in the way we think about what God has to say. There are a few things to notice about this passage. First, the covenant came with promises (or are they predictions?). Does this make a difference? There are conditions. It is by violating these conditions that the covenant is broken. Once broken, the covenant is not in effect. Then comes the unheard of grace—a new covenant. It’s not a restoration of an old covenant. That one has been broken, and as we learned in Psalm 89, no matter what we do we cannot make the promises “have been” fulfilled, because they weren’t. David’s throne was removed. There was no one sitting on it. No amount of restoration years later can make what did not happen happen. Instead, there’s a new covenant. God is now on plan B, unless it’s plan C or D and we didn’t realize it. But at least it’s not plan A. And this is where Christians can go off the rail, especially considering how much this passage is used in the book of Hebrews. The easy Christian solution is to assume that the new covenant that God created is a covenant with the church. And I believe that God does indeed have a new covenant with the church. But having a covenant with his people the church does not really fulfil the words of Jeremiah 31:31-34, because there he says that a day is coming when he will make a new covenant with the house of Israel and the house of Judah. That precludes one set of ideas, specifically that the church replaces Israel, and that Israel as such is no longer a player. But on the other hand we have the view that everything said in the old covenant, the one that was broken, must still be fulfilled. That is not, in my view, scripturally justified. In fact, that is to make the same mistake as those Jeremiah mentioned (7:1-20) who kept repeating: “The temple of the Lord! The temple of the Lord!” God calls attention immediately to Shiloh which had once been the seat of God’s tabernacle, but which had not done so well. So it’s now plan B, or perhaps plan C. (Shiloh?) How do we know the form that God’s blessing will take? Perhaps no eye has seen it nor any ear heard it, nor has it entered into any human heart (1 Cor. 2:9). Bruce Alderman wrote an interesting post today on what has to be somewhere close to my favorite book of the Bible–Jonah. He referenced an earlier post of mine from my Threads blog, but I’m not really commenting on that part. I should also note that while I call Jonah somewhere close to my favorite book, that is a comment that causes my students in real life to burst forth with gales of laughter, since I have labeled way too many passages as my favorites. But the thing about Jonah is that there are so many different things you can get from it. One key element is the way in which people get hung up on the miracle of the great fish, even though pretty much nobody would claim that’s the point of the book. The great fish is largely a literary device to move the character forward. You have the twist of Jonah heading off to the Spanish coast (to use an anachronistic name) but then winding up closer to Nineveh than when he started. It’s an interesting note on the idea of running away from God. Bruce focuses on the hardship in which God places Jonah. Often we’re afraid to comment on such things, but is God really being fair here? He calls Jonah to go to Nineveh, makes him preach this unpopular message, and then turns and makes him into a false prophet. I’m pretty certain we’re supposed to read that subtext in the story; I doubt a Jewish audience would miss it. So you have the intertwining of several messages at this point. First, there is the message that God cares about people who are not Jews. If, as is probable, Jonah was written during the time after the exile, this attitude to foreigners may well stand in opposition to the official position reflected in Nehemiah’s activities. Finally there’s the notion of the call of God on a person, and just how that may work out for the one who is called. I wonder if Jews might have seen in this a bit of the impact of their call or chosenness on their own lives. Being God’s chosen has not always been particularly pleasant for the Jewish people! I like to bring up Jonah when talking about spiritual gifts because inevitably someone is bound to comment on how nice it would be to be a prophet. I have to suggest they think again. Prophets don’t necessarily live happy lives. I like to connect Jonah with Jeremiah 18. Jeremiah is another excellent example of a prophet called into a very unpleasant situation. He has to live in a city under siege and preach surrender, thus getting all the patriots up in arms against hm. In Jeremiah 18 God provides him a vision to explain how it is that God can allow Jerusalem to be destroyed when he had earlier made an eternal promise to David. (See Psalm 89:3-4, for example.) God makes the claim there that he gets to change his mind. What I see in Jeremiah 18 is a fairly clear pointer to God’s major concern in prophecy. We tend to look at prophecy as a way of learning what is going to happen. God’s use of prophecy is to change people’s behavior. If a parent tells a child that he will not get to watch TV tonight unless he cleans his room, it is not the parent’s intent to inform the child as to what his evening will be like. Rather, the parent wishes to get the child to clean his room. If the room is cleaned, nobody becomes annoyed when the child gets his TV time. Perhaps we should consider giving God the same latitude. Yesterday I was listening to the radio in my car and heard a woman caller inform the host that God had told her who to vote for in the election. She hadn’t been sure, and she had been inclined differently herself, but the good Lord told her to vote for Obama, and she trusted God above all, so that’s what she was going to do. Now I would distinguish all of these incidents from the many advocacy e-mails I get from friends and from political lists in that it’s very different to say that you regard certain things as righteous, and that those correspond best with a particular candidate than it is to say that God specifically gave you the right name. It’s a favorite topic of mine. 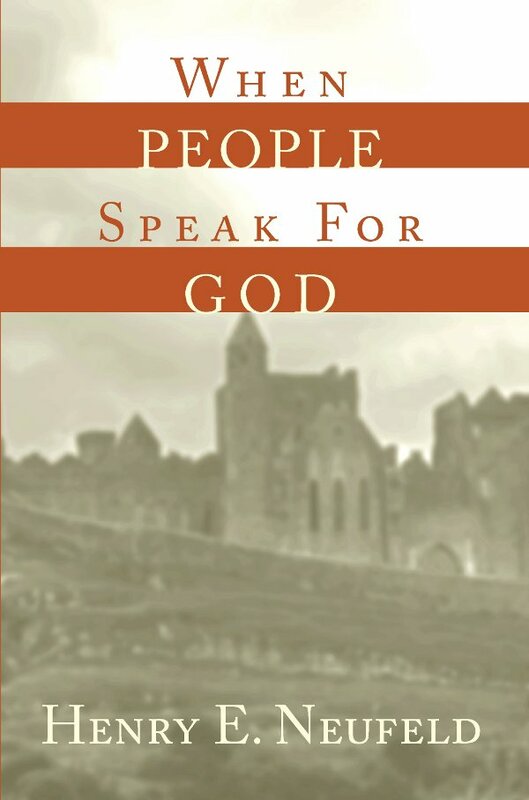 In fact, I wrote a book about it, When People Speak for God. (Potential readers of this blog be aware that about 1/3 of the 246 pages of text was adapted from here.) In that book I dedicated a chapter to dealing with the manipulative claim that God told you something. Now I’m not trying to make fun of all people who hear from God. I will confess to believing that I hear from God as well. What concerns me is statements such as “God told me to tell you . . .” or the obvious implication. I have had people claim that what I told them came from God, i.e. that it was so on target for their situation that it must have. There are three explanations I can think of. First, I might be exceedingly insightful. Second, I might actually be speaking for God without knowing it. Third, it might be random chance. I would vote for the third option. If I were actually to consider all lines of advice I have ever given, considering uncertain items, items that were just plain bad, items that were good but pretty obvious, and finally items that were unusually on target, I’m certain you would find it would be very dangerous to equate my words with God’s will. My own decision making, while perhaps not truly horrible, is certainly no example of what I hope God’s wisdom would reflect! In ancient Israel, false prophecy was taken rather seriously. Deuteronomy 18:15-22 provides that the prophet who makes a false prediction should be put to death. Deuteronomy 13:1-5 suggests that even if he’s right, if his theology is too far (preaching rebellion against God), he must be put to death as well. My point here is not to present a theology of prophecy, but rather to point out that under those circumstances, it would be likely that far less people would want to proclaim something that they claimed God had said. The Biblical prophets actually make a fairly small number of predictions, and only a small percentage of those are very specific and unconditional. Most are more like warnings. “If you do X God will do Y to you.” It’s interesting, however, that a key element of prophetic speech is rebuking and challenging the cultural mainstream of their time. For some reason we do not have the writings of prophets who preached that everything was going well all the time. Second Isaiah (40-55) is one of the most positive and there is still a good deal of rebuke. I recall one pastor who, after hearing me discuss the nature of prophecy with a group of his parishioners, informed me that in their church they preferred “positive” and “encouraging” prophecy and were not so much into rebuke. But in the Bible one of the strong characteristics of the prophets is that they do not come to encourage us to stay as we are. They come to persuade us to change. Since I have both claimed that there is a great deal of “speaking for God” that is clearly false (it’s unlikely both the callers on the radio show heard from God), what is the point of “hearing from God” in the first place? Personally I find that those times I identify as hearing from God are ones that challenge the way I’m thinking and that provide the greatest insights. I have to sift them, because, as I said in my book and here on this blog, a telephone cord has two ends. There’s a speaker and a listener. I tendency when someone claims they heard from God is to focus on the word “God.” God is omniscient and won’t lie, though one should remember that he might send a strong delusion (2 Thessalonians 2:11). So what we hear must be true, right? Hardly! Even if one admits, as I do, that God speaks, there is always the listener. I confess that my biases get into what I hear other people say. If I’m getting loose impressions of divine things, things I understand much less clearly that the topics of human conversation, how accurately will I understand and report those things? Thus hearing from God is a good way for me to push the envelope in my understanding, but everything must be tested. This is also scriptural. Paul tells us in 1 Thessalonians 5:21ff to test everything, hold onto what is good and keep away from every kind of evil. This doesn’t tell us to go back to stoning prophets, but it does tell us to take consideration, testing, and discernment seriously. I think this passage is misread in many ways, or at least it would seem so based on actions. Test everything, keep what is good, but don’t say anything about what is bad. Test everything, hold onto what is culturally acceptable and discard the rest. Test everything, accept everything as generally valid because you don’t want to be arrogant and tell someone they’re wrong. Discard everything because it’s not possible they heard from God in any case. Test everything, keep what you like, discard what you don’t like. Bottom line here, however, is to take responsibility for what you think and say, and also for what you hear, whether or not someone claims it comes from God. Try to find ways to find out if it’s true, moral, and useful (not moral or useful, the and is intentional).